Using the client’s assets and style guide to promote the items they wished to showcase in the ad, I formatted the ad space to fit Favado specifically. 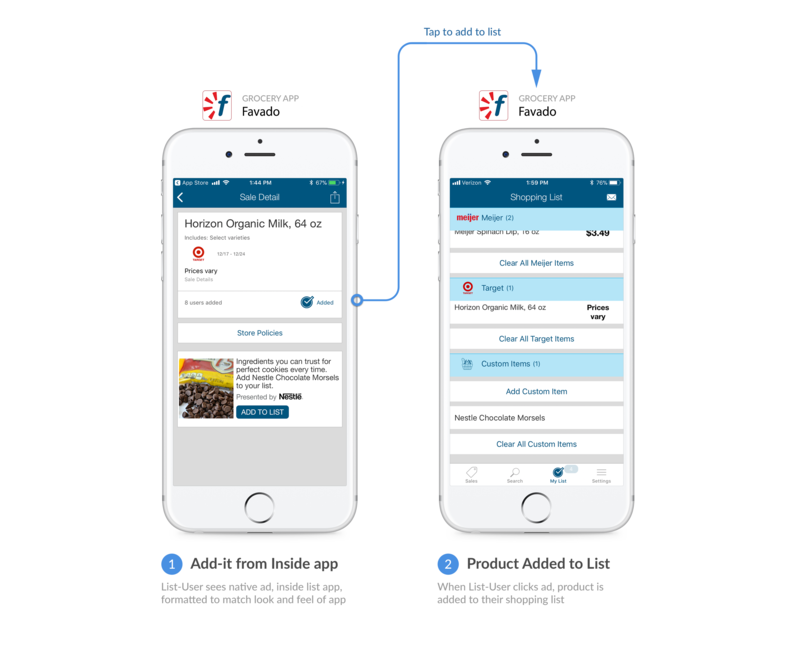 The goal with these ads was to target users who are already using the Favado app to add these items from the ad to their Favado “list”. This is accomplished two ways: native ads, which pop up while the user is shopping on a grocery app with the CTA “Add to List.” This is an in-app tactic. The out-of-app tactic uses banner ads (labeled above) which pops up when the shopper is using something other than a shopping app (in this case, the fictitious app “Simply” is shown to illustrate this) and will route the user to Favado, where the item is automatically added to Favado’s shopping list. 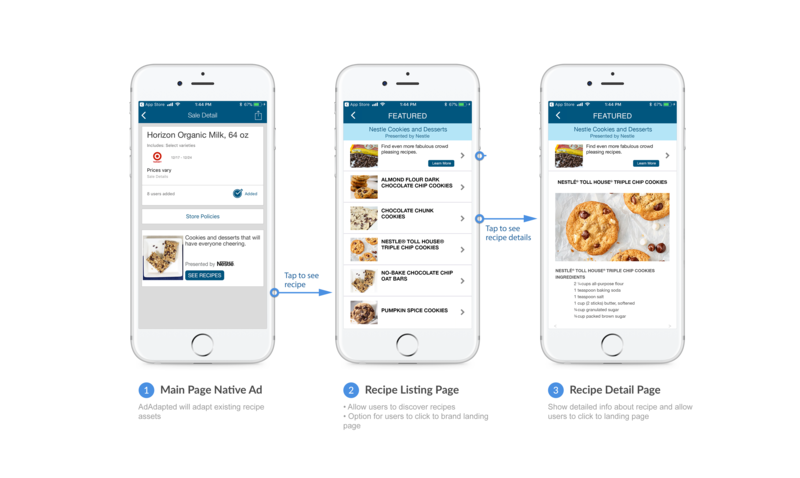 Aware campaigns allow the user to become familiarized with recipes and products they may not have heard of before within the app. 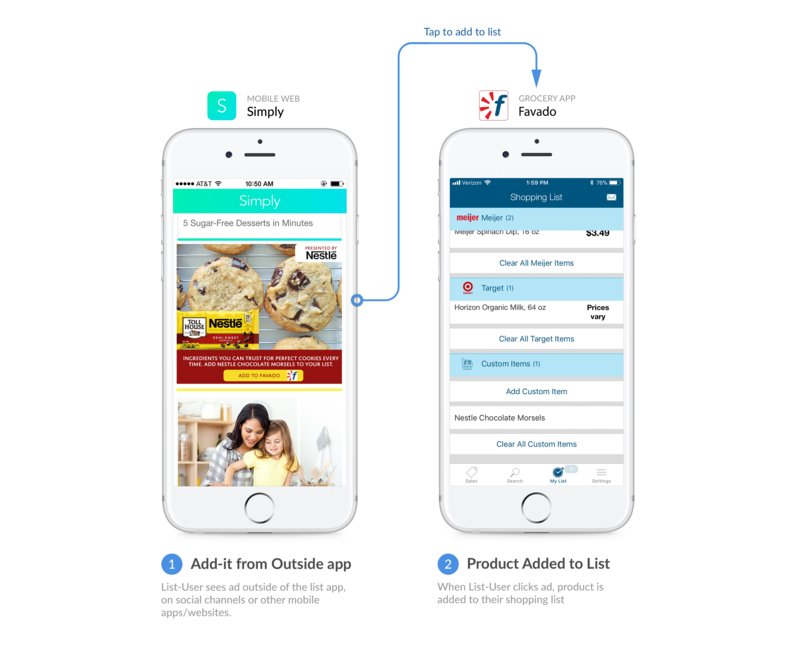 An awareness ad for Favado is shown in the design labeled “aware flow.” It is the same technique as the “add-it,” but in this case, will route the shopper to Favado’s recipe detail page from an in-app native ad, where they can learn more about how to use the CPG ad targeted item in a recipe, all in-app.